Thousands of children in England are not getting the affordable nursery places promised by the government four years ago, a report has found. Many parents, particularly those on low incomes, are turning to grandparents and friends for free childcare instead. 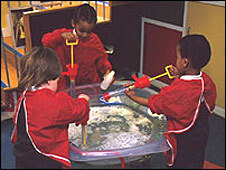 Gordon Brown, the then chancellor, had promised in 2004 that his 10-year childcare strategy would help create a "truly family-friendly welfare state". But a government-funded study found it had not had as much impact as intended. The strategy included an extension of free nursery education for three and four-year-olds and an extension of the school day with after-school clubs and childcare. Mr Brown said at the time that the aim was to guarantee parents more accessible, affordable and safe childcare while they were at work. However, the survey of 7,200 parents conducted last year showed many families in England could not find affordable childcare. And figures suggested about 56,000 three and four-year-olds were not accessing any free places. More than a third (36%) of the people polled thought affordability was fairly poor, or very poor, and around the same number (37%) felt there were not enough childcare places in their local area. Nearly half of parents had left their children with grandparents, and about one in five had turned to other relatives or neighbours. The number using formal care in the week before they were polled has remained the same at 40% from 2004 to 2007, it was found. The report said cost remained an important barrier to the use of childcare for some parents, especially large families and those with younger children. A minority of unemployed parents felt they could not find childcare that would make working worthwhile, it added. It also found nursery costs were rising. On average, parents spend £27 a week on childcare, while a nanny typically costs £5.33 an hour, with costs rising in London and south-east England. The study was produced for the Department for Children Schools and Families by researchers at the National Centre for Social Research. A spokesman for the children's department acknowledged the take-up of childcare among lower income families was lower than among better-off families and said that was why it was spending £3.5m a day on support for childcare through the working tax credit. He also said the department was helping 50,000 parents who are training for work with childcare, providing free early education entitlement for the most disadvantaged two-year-olds and planning to provide support to families with a disabled child. Dont really know if this is relevent but if you recieve tax credits you get 70% towards your child care fees and if you are a student in further education and your partner works it may be worth your while dropping the child care element from your tax credits as your local education authority will pay 85% of your child care fees which is better than the rate child tax credits will pay and this is applicable all year round even in the long vacation so its worth looking into if you are a student. Last edited by theGobbyOne; 2nd June 2008, 19:58:PM. Reason: spelling!!!!!!!!!!!!!!!! !